Portable chlorine, turbidity, and color meter measurements in one meter. The TC-3000 Portable Chlorine Meter is ideally suited for both low-level drinking water applications as well as monitoring high turbidity in the field. The portable chlorine meters have a six-detector design with special focusing optics allowing for long-term stability over a wide range of operational conditions. 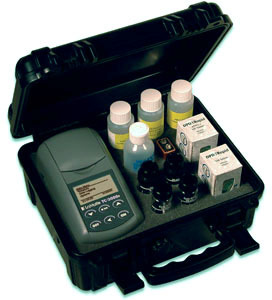 The portable chlorine meters use the unique detector arrangement to measure Chlorine, Turbidity, and Color. The portable chlorine meters come in two designs: one with a tungsten lamp to meet EPA 180.1 turbidity specifications, the other comes with a IR LED emitter and meets the ISO 7027 turbidity standard. The portable chlorine meters use a tube-positioning ring to limit tube variability enabling maximum sensitivity and accuracy. The TC-3000 Portable Chlorine Meter uses an advanced micro controller which allows for advanced calibration algorithms and support of up 6 languages including English, French, Spanish, Japanese, Portuguese, and Italian. The portable chlorine meters can record up to 4000 time and date stamped data points. The portable chlorine meters are compatible with Smart Link 2 software allowing the unit to interface with a PC and download data for analysis. The portable chlorine meters have an easy to use menu driven system displayed on an easy to read graphic LCD display. The portable chlorine meters have three different measurement modes, chlorine, turbidity, and colorimetric testing. The portable chlorine meter includes 100 DPD 1 and 3 chlorine reagent tablets allowing you to perform 100 chlorine test measurements. Global Water offers liquid chlorine reagents in 60mL bottles, which will allow you to make an additional 250 chlorine measurements. For turbidity measurements the portable chlorine meter should be calibrated using the included turbidity standards. The portable chlorine meter’s turbidity standards have a one-year shelf life, however you should calibrate your turbidity measurements every four to five days. The recommended method of calibration is to pour 10mL of standard into one of the four provided testing vials and label it appropriately. This 10mL sample can be used for approximately one month before needing to be replaced. The portable chlorine meter’s colorimetric measurement mode has been calibrated with colored standards of known concentrations of platinum cobalt. One unit of color is equivalent to the color that is produced by 1 mg platinum/L in the form of the chloroplatinate ion. You will need to initialize the portable chlorine meter’s colorimetric test by using a colorless blank prior to inserting your test vial. Includes 0, 1, and 10 NTU standards, sample bottle, 4 sample tubes, DPD tablets, and extra battery. 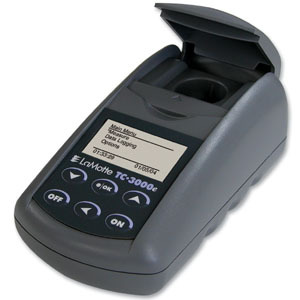 Interface the CODPlus Portable Colorimeter with a Windows-based personal computer. The program can be used to download data stored in the dataloggers of the meter. The program allows the user to identify, organize, view, manipulate and store data as a database on a PC. Data can also be copied and pasted or exported to other applications as and ASCII tab delimited text file. NOTE: This reagent is required to test for both free and total residual chlorine. NOTE: This reagent is required to test for total residual chlorine. Includes sample cup with cap, 5pks of 10 reagent tablets, batteries, and a 48” neckstrap. 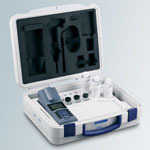 Includes calibration kit (0.02 - 10 - 1000), 2 empty cuvettes, cleaning tissues, batteries (4 x AA), and field case with table insert.